Billed as a modern re-telling of FRANKENSTEIN this follows Em, a techie student who falls in love with a young farmer near her college. On her way home for the holidays to her widowed father she is involved in a near fatal bus crash. 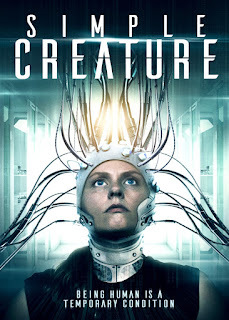 Her father who is working on a human enhancement programme at a research lab called Singularity manages to bring her back from the brink by using Nanotechnology, robotics and a micro chip implanted into her brain. To everyone else she perished in the crash, so after 2 years of rehabilitation with her memories returning she manages to escape and returns to her lost love in the country. Things have not gone well for her boyfriend, Seth who lost his father weeks before her accident so is grieving the loss of 2 loved ones. He is left with his traumatised mother and the family farm which is in debt. After the initial shock of seeing Em again but relieved to be back together they have a couple of issues with the local farming community who believe that technology, in particular Singularity, are the route of all their problems and the fact that the scientists who created Em want their greatest achievement back no matter what. I get where they are coming from with the FRANKENSTEIN reference and it is a different take on it but it is very loosely based on this. That being said it is a compelling story and I absolutely adored the 2 main characters. Em (Carollani Sandberg- All Things Hidden/Z Nation) and Seth (D’Angelo Midili- Grimm/Z Nation) made a great on screen couple and I instantly loved them both. Being a cast member from either Grimm or Z Nation seems to be a theme here as pretty much all the main cast has been in either or both of these shows previously which is no bad thing. It was great to see Russell Hodgkinson (Doc in Z Nation) play a straight character so well. Some good use of practical effects though there is very little of them but it is more of a Sci Fi/Thriller movie than a horror, and an effective and atmospheric soundtrack. I have to admit at times though it was a little slow and awkward, on occasion it seemed like things would be coming to a head but then nothing would come of it. Towards the end the pursuing researchers seem like little more then your typical cartoony evil scientists with some dodgy dialogue and questionable actions. I think that some things were over complicated and others were not explained enough but I did enjoy this and would recommend checking it out.